Since the late 1920s, planners and engineers have conducted travel time and delay studies to unravel the intricacies of transportation. With the instatement of the revolutionary Intermodal Surface Transportation Efficiency Act of 1991 (ISTEA), flexible state and local programmes were developed to address urban, suburban, and rural congestion. Travel time, a key performance measure in congestion management systems, is one of the few ITS concepts readily understood and communicated by everyone from your local news reporter to the daily commuters in the trenches. Now that we’ve taken a brief trip through the history of travel time data, you may be wondering how a concept so basic has evolved over the years? Two words: the cloud. The introduction of cloud-based technology has impacted a diverse range of industries, and transportation is no exception. Existing data collection systems used by numerous DOTs require fixed sensors at designated areas, which must then be processed by application-specific central software before being displayed. With the introduction of cloud-based travel time data, DOTs stand to reduce costs, increase coverage, and provide accurate travel information around the clock. Existing data collection via road side sensors are limited to the highways and major roadways equipped with Bluetooth sensors, leaving secondary, rural, and remote roadways uncovered. In order to get more coverage with existing systems, new sensors would have to be installed along the routes you wish to track. With cloud-based technology, your traffic management system can leverage third-party providers, such as TomTom, Google, Inrix for unlimited coverage. If you’re using a traditional travel time system, you’re responsible for not only the upkeep of the application-specific central software, but also the roadside Bluetooth sensors. This includes routine maintenance and periodic replacement, all of which are eliminated with cloud technology. As we mentioned above, cloud-based time travel leverages third party provider data, meaning you are not responsible for any hardware (sensors) or application-specific software. If you wanted to change the time travel route using existing technology, you would need to first establish if the proper sensors are in place. If not, the next step would require the procurement and installation of sensors, causing unnecessary time and expenses. Cloud-based travel time provides an unparallelled ability to adjust on command. Point and click route configuration eliminates the reliance on roadside sensors and can dynamically recommend alternative routes based on thresholds. Unfortunately DOTs aren’t given unlimited resources, which calls for tough decision making by the engineers and planners in charge. Cloud technology, regardless of the industry, operates within a model of on-demand access to a shared pool of configurable resources. In the case of travel time data and display, cloud technology provides a cost-effective solution that makes use of existing third party data and eliminates expensive equipment. DOTs are now able to deploy a sophisticated fixed or mobile systems, while conserving resources for other higher value needs. At the end of the day, time travel data collection and display systems are just one component designed to increase the safety and efficiency of traffic operations. By providing accessible and instantaneous travel time data to drivers, you can manage congestion, improve the flow of traffic, and create a more enjoyable roadway experience. 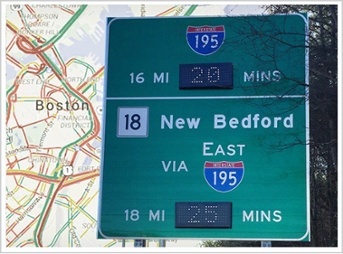 DMS Connect, SESA’s first ever cloud-based traffic management solution, allows the display of travel times for custom routes to be constantly updated on any DMS or retrofit sign anywhere without the need for any fixed speed-sensing infrastructure all through our NTCIP controller SCU6.